Oh, so sorry for the long delay in posting here… stuck in ActualSpace, neglecting PixelSpace. So… one day I realized that both typewriters and cassette recorders have this ribbon-y thing running through them, back and forth. Both are chunky, and both create permanent artifacts. Both are occasionally feeling a bit, er, neglected under a wave of glowing tablets. So, let’s invite fans of both to a cozy bar (restaurant, too, so yes Matt “Manyfingers” Cidoni, you are legal/invited!) in Philly, I thought, and called Mr. Fergus Carey before I could re-think. Fergie of course being Fergie, said, “Why not?” and now hello Tape N Type. A Type-IN, but louder. Activities will include: (but are not limited to) : Typing Speed Competition with wifty prizes, Mystery Mixtape Box (“One Tape Enters, One Tape Leaves”), Headphone Charades, Typewriter/Boom Box Swap, Instant Interviews and no doubt more. Bring Typewriters, Audio Cassettes and machines to play same, headphones/earbuds, journalist-style portable tape decks, Carbon Paper, and mixtapes to toss in said MM Box. 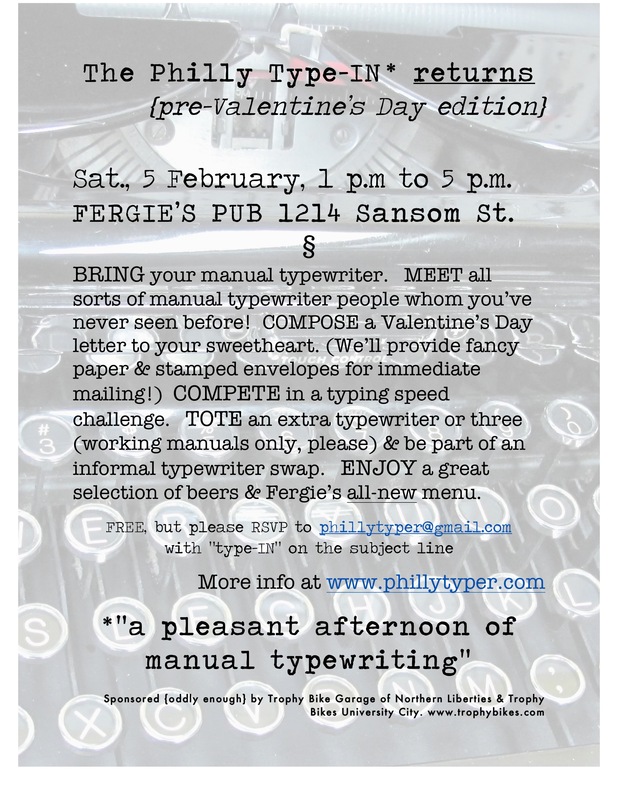 WHERE: Fergie’s Pub 1214 Sansom St., downtown Philadelphia, just blocks from Market East Station. PRICE: Free, if you’re carrying anything relevant to the above list of Mature Technologies! Makes typing sound visionary, yet normal. I’d better go down and type something! Second machine on deck was a French-made Hermes 3000, purchased (twice) by Philadelphia Inquirer movie writer Steven Rea. Bryn Mawr College had not one, but two Jens representing them: web-designer Jen Yuan, again with her Olivetti Valentine and Jen Callaghan, who runs a writers’ program at the school. Trophy Bikes mechanic and devout cyclist TJ Seningen stopped by to complete the group. I had no clue when scheduling the Type-IN that Feb. 5th was also World Nutella Day–but Ms. Yuan, better-informed, unpacked a jar of this high-calorie chocolate spread, along with bread and knives so that we essentially were celebrating two events in one, as well as an extra day’s intake of carbs. 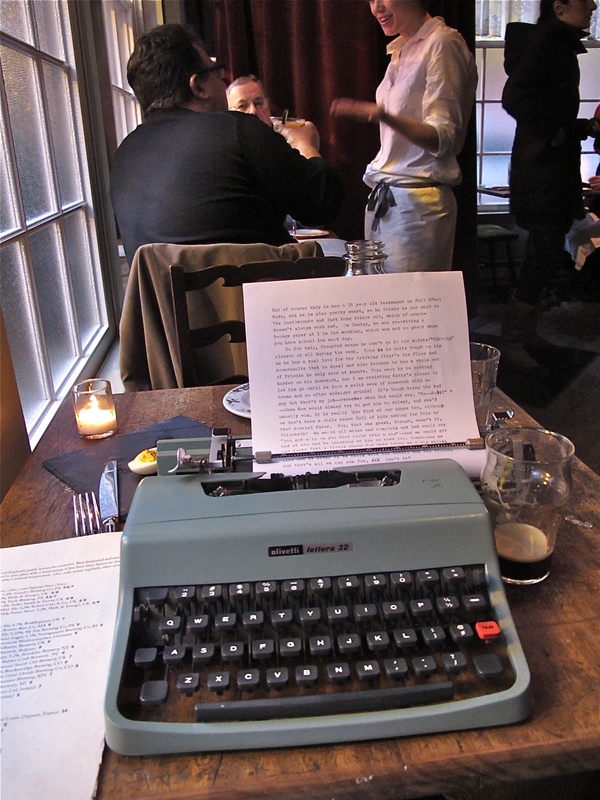 A pair of writers from Geekadelphia were also on hand and refrained from remarking on the hazards of mixing Nutella and manual typing–we hope their story will be discreet about this practice. The small field precluded a Typing Competition, though we did see several letters completed. No one opted for a splash of Clinique’s budget “Happy” fragrance–so this mailing was totally scentsless! (sorry) Finally, we did perform a Typewriter Roller Call. 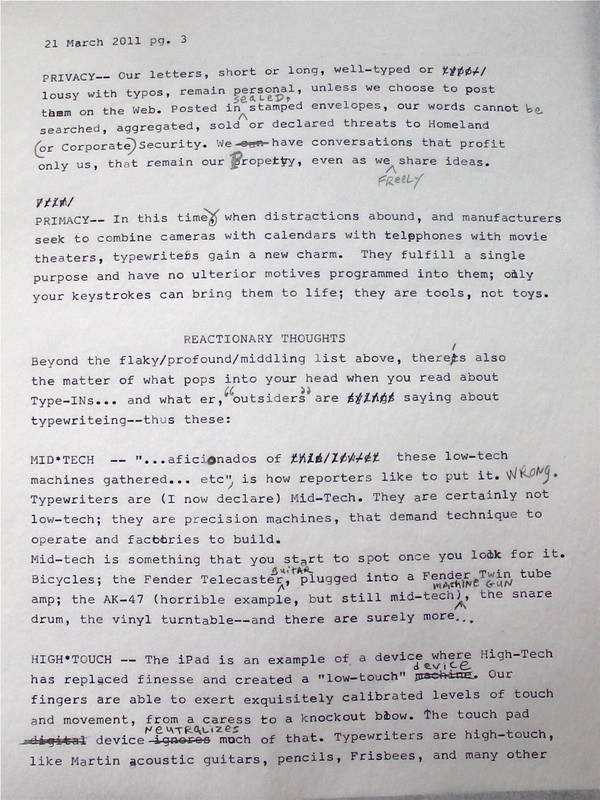 This involves a sheet of paper starting in one typing machine, where its owner (or whoever is sitting in front of it at the time) types the make and model, their name and perhaps a sentence or two. 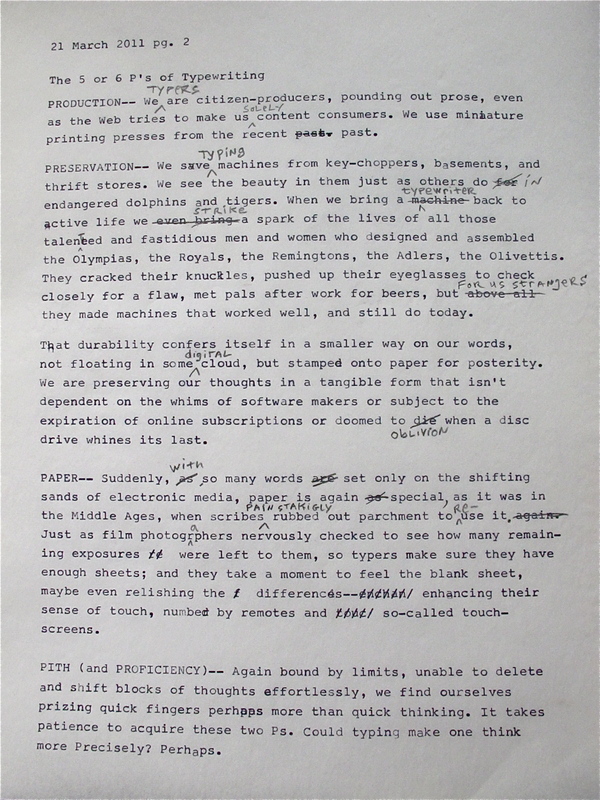 (as shown here) Then the page goes from machine to machine, with each person typing a line or two, in that machine’s particular typeface… till the page is full. 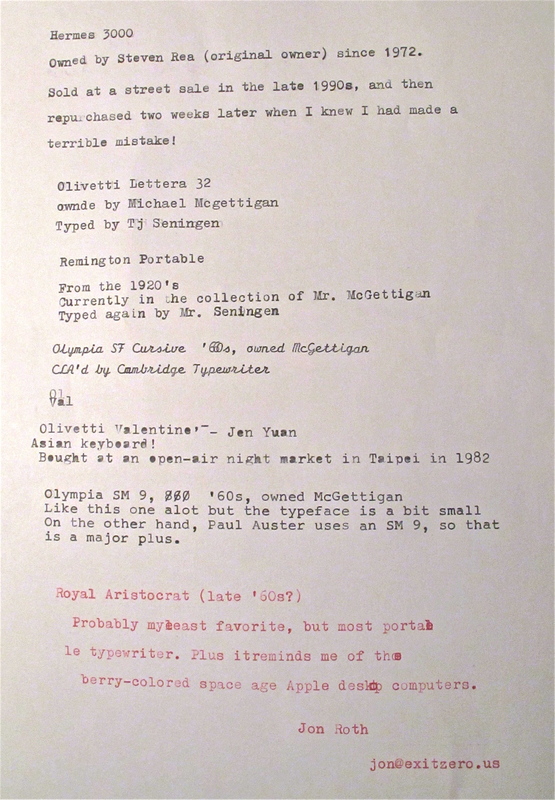 This page travelled through several typewriters--and survived! 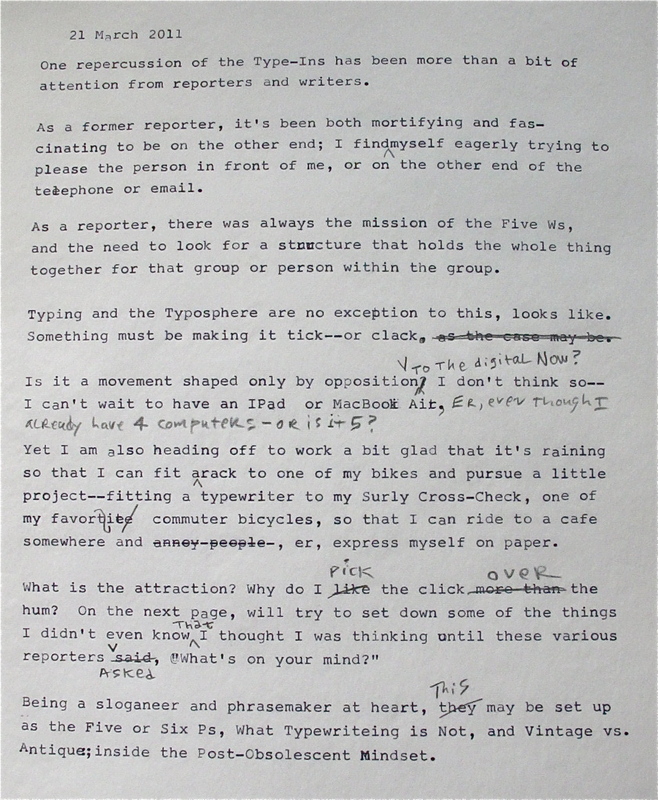 Now, what would be interesting is to see a few Typewriter Roller Calls, single-spaced, so as to get a lot of typewriter fonts onto a single sheet…. Mr. Roth is an editor at Exit Zero, a well-done online guide which will make you want to go to Cape May sooner rather than later. Ms. Yuan has hacked cats into dogs and shows how here. Fergie’s Pub is run by Fergus Carey & would be a wonder just for their newspaper ads which (truthfully) declare: “NO TV!”, but they don’t stop there, making sure to have plenty of craft beers on hand, as well as good food & really sturdy tables. 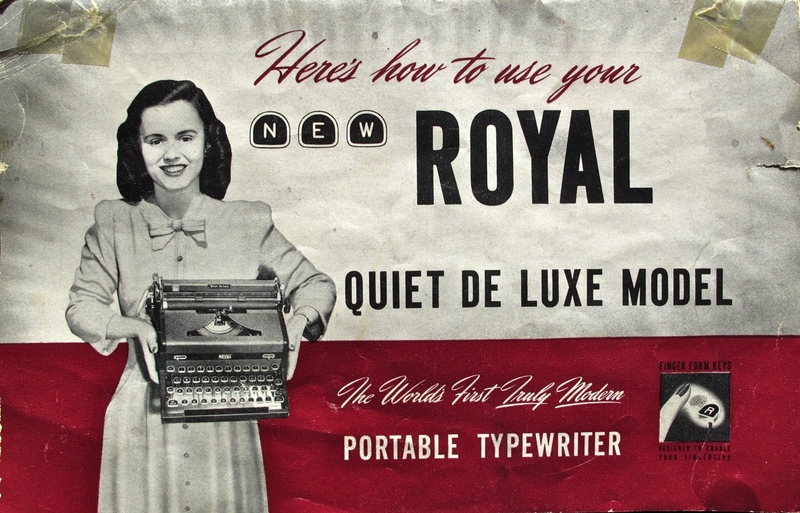 About 62 years ago, Kathleen’s mom went to the store–and came back with a brand new Royal Quiet De Luxe typewriter. That's a lot of money in 1948! 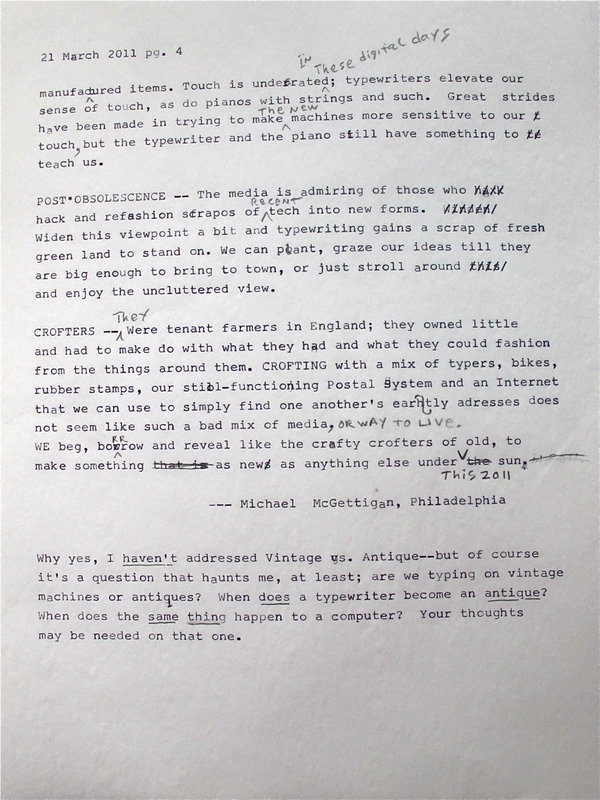 THE WORLD’S FIRST TRULY MODERN TYPEWRITER, boasted the manual–and hey, this machine had some clever features–a one-touch Magic Margin (Registered Trade Mark), “Finger Form Keys”, and Shift Freedom–the keys dropped down for caps–then a spring lifted them up again–boy, was that a nice feature. Kathleen used that machine for schoolwork, for classes when she had secretarial school, and for letters to friends and family. By and by, it was used less, but she always kept it in top shape, and stored it carefully in the basement when she stopped using it. She kept the manual and the brushes and the extra ribbon spools and even the price tag from the day it came home from the store. Then the Philadelphia Inquirer and the Daily News wrote about an odd little gathering of people who still liked manual typewriters. The young girl was now a grown up lady. She’d been wondering what to do about her Royal, and had maybe even thought of giving it to a thrift shop or putting it out on the curb. She called up the bike shop mentioned in the typewriter story and asked for Mike (er, me) and explained about the Royal and that she didn’t want any money for it and said “I just want it to go to a good home.” So I drove out to Mayfair in Northeast Philadelphia and found her house easily (she gave perfect directions). It was the one right next to the Notre Dame football fan with a street sign in his front yard that said, “FIGHTING IRISH”. The Royal was a bit heavy and so she had a neighbor tote it upstairs. We talked about how her mom bought it for her and some of the things she used it for, and I promised I’d make sure it would go to someone who would take good care of it. I took some pictures of her holding the typewriter–I hurried because it looked heavy. Then I thanked her and put it in the car. I put it into the back seat instead of the trunk just because…. Then I drove it back to Trophy (that’s the name of the shop). 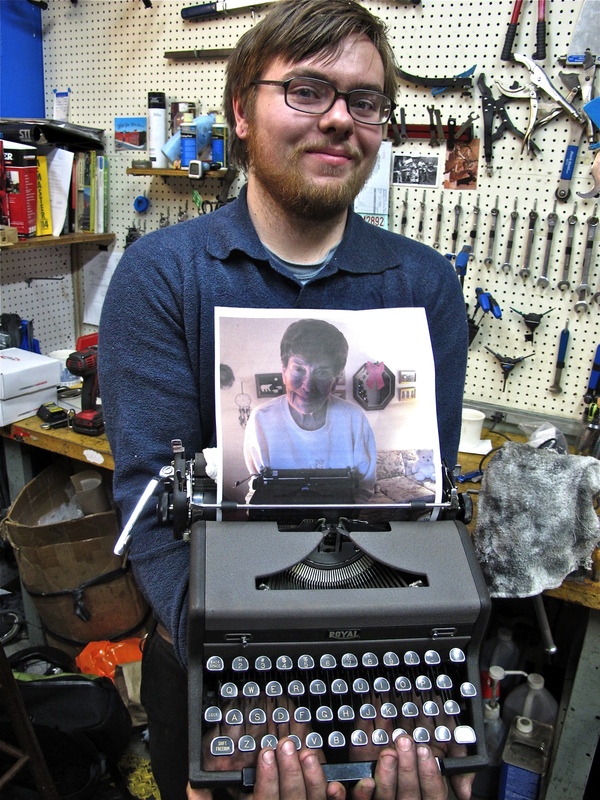 Since the Type-IN, some of the mechanics have been getting excited about typewriters. TJ is one of them. He really wanted an older Remington I had, but well, I didn’t want to give it to him because I liked it, but also because it was kind of fragile and I think TJ wanted a machine to really write on a bit. At the shop, there really wasn’t much needed for the Royal (it really had been taken good care of!) , so in between talking to customers, we used compressed air to blow any dust out of the machine, put in a new ribbon, and brushed the typefaces a little. It typed perfectly, with a really nice light touch. It looked different from all the other typewriters we’d seen lately; dark gray with even darker gray accents gave it a serious, almost West Point air. TJ likes all sorts of good machinery, and he’s really starting to get interested in typewriters… after a few minutes, he finally, said, “OK, how much for it?” I just said, Merry Christmas. 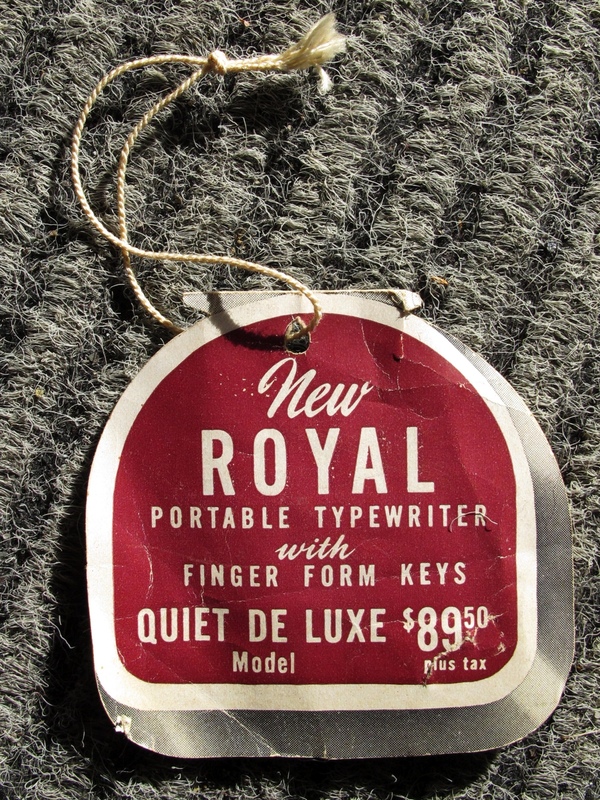 When I left the shop, TJ was typing out labels for presents on the Royal Quiet De Luxe. Thanks Royal. Thanks newspapers. 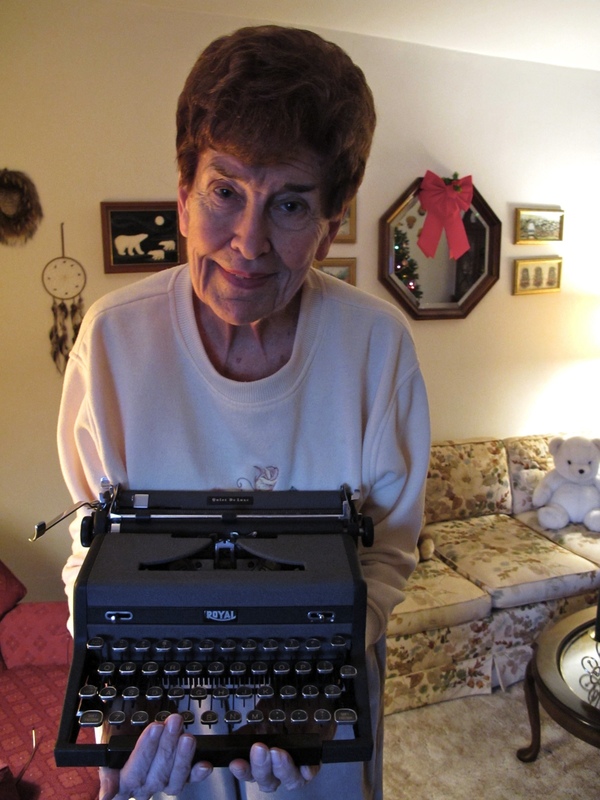 And thank you Kathleen Murray for the typewriter–we’ll take good care of it. 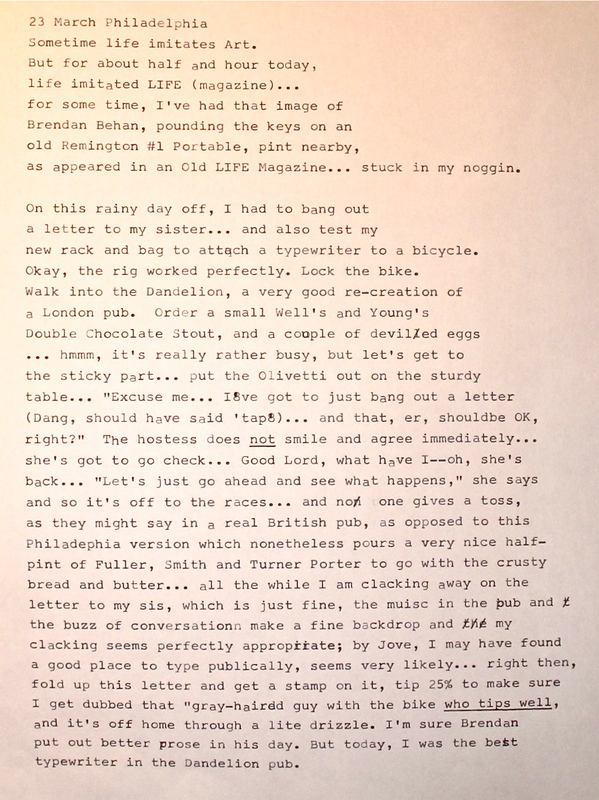 Novelist Paul Auster has declared his allegiance to manual typewriting, and I recently finished one of his novels in which a main character is named Fanshawe–which is also the street that Ms. Murray lives on. Coincidence? Of course. But we’ll take it.